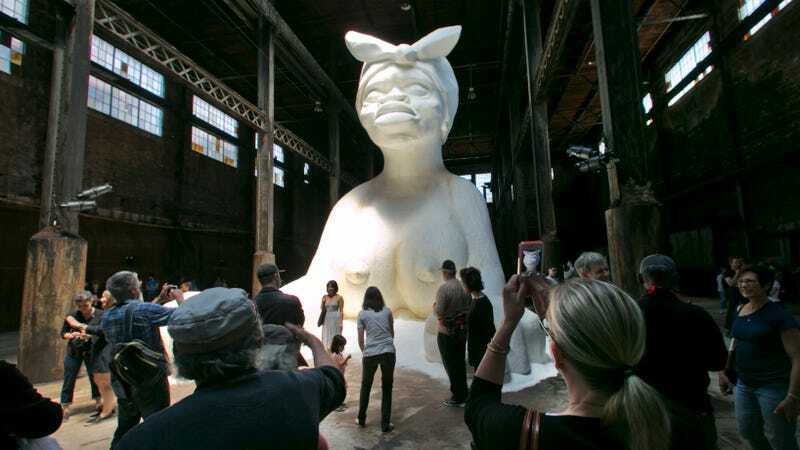 Kara Walker’s “A Subtlety or the Marvelous Sugar Baby,” 2014. Image via the AP. So Kara Walker’s latest statement is a gem. I don’t really feel the need to write a statement about a painting show. I know what you all expect from me and I have complied up to a point. But frankly I am tired, tired of standing up, being counted, tired of “having a voice” or worse “being a role model.” Tired, true, of being a featured member of my racial group and/or my gender niche. It’s too much, and I write this knowing full well that my right, my capacity to live in this Godforsaken country as a (proudly) raced and (urgently) gendered person is under threat by random groups of white (male) supremacist goons who flaunt a kind of patched together notion of race purity with flags and torches and impressive displays of perpetrator-as-victim sociopathy. I roll my eyes, fold my arms and wait. How many ways can a person say racism is the real bread and butter of our American mythology, and in how many ways will the racists among our countrymen act out their Turner Diaries race war fantasy combination Nazi Germany and Antebellum South – states which, incidentally, lost the wars they started, and always will, precisely because there is no way those white racisms can survive the earth without the rest of us types upholding humanity’s best, keeping the motor running on civilization, being good, and preserving nature and all the stuff worth working and living for? Collectors of Fine Art will Flock to see the latest Kara Walker offerings, and what is she offering but the Finest Selection of artworks by an African-American Living Woman Artist this side of the Mississippi. Modest collectors will find her prices reasonable, those of a heartier disposition will recognize Bargains! Scholars will study and debate the Historical Value and Intellectual Merits of Miss Walker’s Diversionary Tactics. Art Historians will wonder whether the work represents a Departure or a Continuum. Students of Color will eye her work suspiciously and exercise their free right to Culturally Annihilate her on social media. Parents will cover the eyes of innocent children. School Teachers will reexamine their art history curricula. Anyway. It’s not art, it’s just art.